Behold & Reflect: Asking Myself: What is it that reconciles us with God? 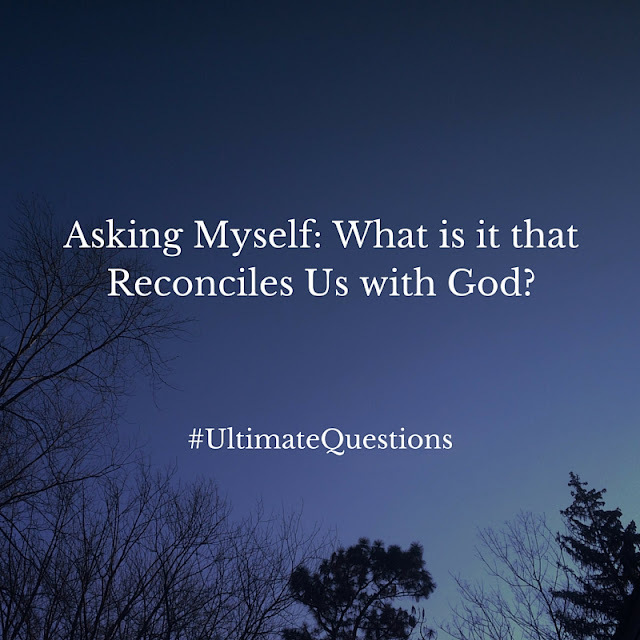 Asking Myself: What is it that reconciles us with God? This is the fourth installment of my series "Asking Myself," in which I weekly ponder one question posed in Teresa Blythe's rich book, 50 Ways to Pray. You can find the start of the series here and last week's post here. Q: What is it that reconciles us to God? So, to answer the initial question, there's the once-and-for-all fact that God has reconciled us to Himself through Christ's bodily, bloody death on the cross.... and no, I don't really understand how that works or even why that was the only way to do it, or why God chose that way. I'd like to. But it's enough for me to take security in the story of Jesus' deep love for even his enemies--a love that can see beyond evil thoughts and actions and by faithfully acting on the potential he saw in us to become his fellow sons and daughters and fellow and joint heirs, he created the possibility of it being so. Then I have to sit with the word "reconcile" for a bit. Cuz I noticed that in the verses, there's more than just God reconciling us to Himself. Reconciliation brings me right into His presence, and His loving presence is what transforms my thoughts and actions so that I can experience my being reconciled, at peace with God, who happens to be at peace with everything. Like, what? This is the more intriguing question to me: Why did Christ's death set in motion a universal reconciliation that rolls out to all things? And what does that mean? If God is at peace with everything... can I experience that same peace, perhaps the kinds that passeth understanding, with, say, myself? I'm about to get a little raw. At the risk of sounding New Agey Self Helpy, I'm struggling most with being reconciled with myself-- the self I want to be- for God, for my family, for my friends, for the world- and who I see myself to be. The undervalued self. The reclusive friend. The lousy wife. The screw-up mom. The one who, the other night, made all her kids cry at once and felt like crying herself after the perfect storm of pencil on the wall, poop not in the toilet and burnt pizza. The one who never carries out any of her dreams and only realized those dreams were good and pure and right in her mid-30s, when it was already too late to really make something of herself, too late for Malcolm Gladwell's 10,000 hours, too late to become an expert Emily, in my unique calling, because I still haven't figured out what it is. I'm not ending here, and don't want to agree with the above paragraph, though this is about where my heart has landed with this topic. Fact is — No, truth is that God is totally, 100 percent reconciled to that mess of a person. How can I not follow suit? When I turn my eyes on Jesus, I don't feel his displeasure. I feel holy and blameless under his tender gaze. So how is it that I am so displeased with my own reflection? How do I tap into that all-encompassing peace and reconciliation? I don't have an answer this time. Next week: What is eternal life? Winsome Wednesday "What Things are True"
Asking Myself: What is the nature of God? Asking myself: How does God find us? Asking myself: How can we find God?